GoPugliaTrust a local to show you around! Puglia, the “heel” of the boot is a fascinating ancient region with hundreds of charming little villages many of which go back to the second or thirds century BC. Lecce is one of the most important cities often referred to as the “Florence of the South” for its baroque architecture. Alberobello is a town in the heart of the Itria Valley home to thousands of “trulli,” stone huts with distinctive conical roofs. Ostuni is also known as the white city, every home is washed with limestone on the outside, a common practice throughout the southern part of the region. An incredible coastline wraps the region around the Adriatic and the Ionian Sea and frames low hills and plateaus filled with grapes and olive trees. Puglia has been ranking for three years in a row one of the must visit places in the world. A perfect option to the too touristy and crowded Tuscany, Cinque Terre and Amalfi Coast. 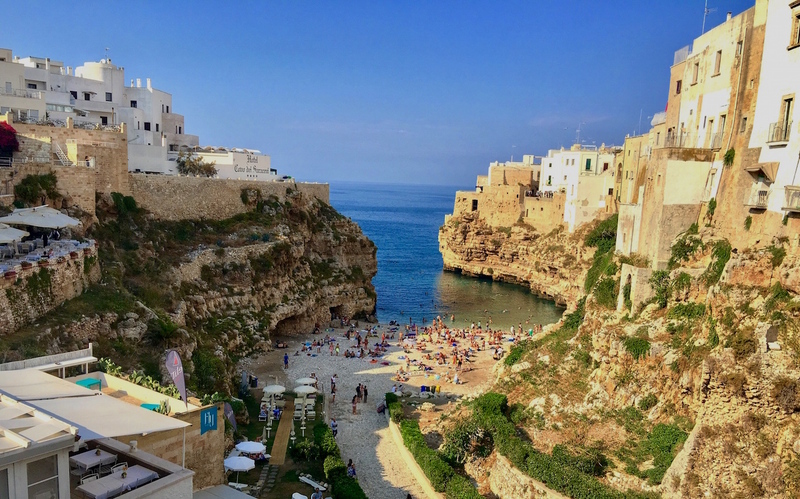 Puglia offers you the most incredible food, amazing climate, fabulous beaches, millions of ancient olive trees, and some of the most luscious wines in the entire country. A fish lover experience that has no comparison with eating out in a restaurant. Accompanied by a local from Manduria, you will stop a few times along the Ionian coast to walk on the beach, smell the aromatic wild herbs growing over our dunes, and admire four to six hundred years old olive trees. 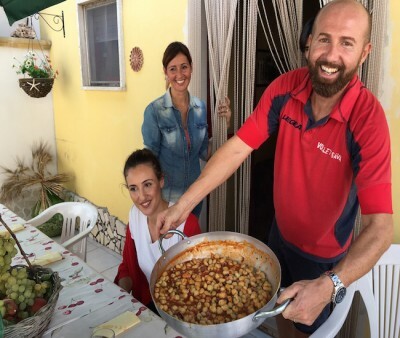 For lunch you will be invited into the home of Massimo and Graziana, childhood friends of Antimo, who will cook for you a delicious meal using day fresh fish caught by Massimo himself during his spearfishing outing. 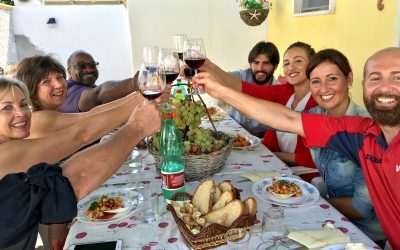 You will enjoy a slow paced lunch prepared from scratch with products from Massimo’s farm and garden as well is home made Primitivo wine. They family will join you for lunch and provide you with an authentic meal and wonderful company. Lunch can last 2-3 hours, just relax and enjoy! It the weather is in your favor, this will take place at their lovely beach house on the Ionian Sea. The amazing climate, the soil of Puglia, and its proximity to the sea, are the perfect elements for a the cultivation of Primitivo Grapes and other varieties that thrive in the hot sun. 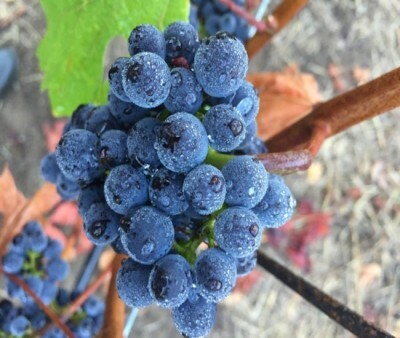 The Primitivo varietal known in the USA as Zinfandel is among the very first one to be harvested (Typically between end of August and 1st week of September, hence why the name Primitivo – which means early). Join our local for a unique wine tasting experience as you travel through time and space, stopping in the vineyards with an expert to learn more about local grapes. This experience takes place in Manduria, a town on the outskirts of the famous Salento Region. The production area for Primitivo di Manduria wines stretches eastwards along the Gulf of Taranto for about 25 miles (40km), an areas largely consisting of plains sloping very gently down to the sea. The vineyards here are ancient, and share the land with endless olive groves; Primitivo di Manduria is now gaining international recognition so come find out for yourself why! 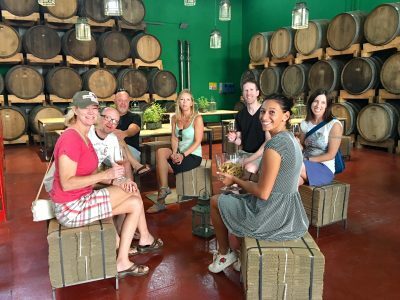 In Vino Veritas, can be enjoyed over lunch or dinner, it will include food, wine tasting at two large wineries in Manduria, a wine and civilization museum visit, and a small amazing family run winery in the center of town. Immerse yourself in the ancient culture, rituals, and traditions of an old land that saw waves of invaders and settlers (Greeks, Normans, Byzantines, Romans..etc.) all of which contributed to the creation of a complex cultural landscape. 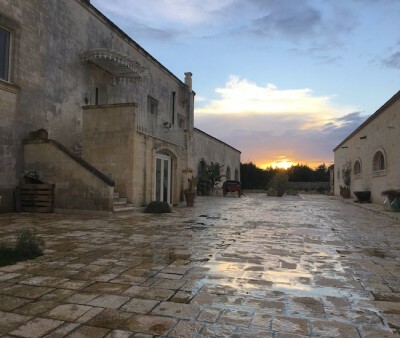 This experience will take place in the beautiful setting of an old Masseria (Farm house) from the late sixteen hundreds surrounded by a young olive grove. 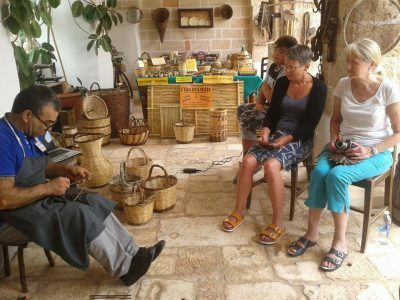 A few locals will share their passion and art forms with you, from weaving baskets, to making olive oil soaps, to shuttle tatting and traditional dance (Tarantella).